Pre-game, and among the main talking points about the 2014 AFC Challenge Cup Group B encounter between the Philippines and reigning South Asian champions Afghanistan would have been the latter’s lofty position in the latest FIFA Men’s Ranking Table. Indeed, at 128, there is a menacing 12-point gap between the Afghans and the Filipinos, who are currently at 140. Post-game, and the talking point would have shifted to the most obvious of questions: how in the world did they get there? After 90 minutes of a goalless stalemate which the Philippines could feel entitled to feel hard done by, there was no doubt whatsoever about which the better team was. It was apparent even early in the match that the Philippines had the better individuals. The question of who was the better team took a little longer to resolve; and it was not until the final half an hour that the Filipinos started to get a firmer grasp of the game and clearer sights of the Afghan goal. But a game of football is never an open book; and the scoreline does not always tell the entire story. Afghanistan captain Haroon Fakhrudin’s header sent the ball crashing against Neil Etheridge’s bar in second half added time and could easily have supplied the story’s cruel denouement. In a manner of speaking, we played against the top-ranked team without our spine. All the other teams be forewarned. The Philippines will be an entirely different proposition when all the top players become available and click into gear. To whom it was cruel, the Afghans would doubtless have a word or two to the contrary; and indeed, the Philippines could have defended the set piece from off Daisuke Sato’s late foul on the right flank a tad better. The truth was, however, that even had the Afghans scored from that header, the goal could easily have been no more than a consolation. James Younghusband could have opened the scoring just before the first half ended with a thumping header against the crossbar. In the second half, particularly, the Philippines had more than enough chances to have put the game away with plenty to spare. There was the little matter, however, of one Stephan Schröck and the shooting boots he seemed to have left behind in Frankfurt. The diminutive Fil-German could have opened scoring after half an hour with an audacious chip that nearly caught out Afghan goalkeeper Mansur Faqiryar. That the ball fell onto the top netting was portentous of the rest of the night for the Eintracht player. In the 78th minute, he interchanged passes with OJ Porteria with the Afghan defence back-pedalling. The glorious move was capped by a nonchalant shimmy past two Afghan defenders before a left-footed shot was despatched towards goal. The moment was crying for a goal; but the ball was not even on target. When Schröck was finally on target with a right-footed shot minutes later, Faqiryar was up to the task and swatted the ball away and into safety. Still, the rest of the Filipinos feasted on the effervescence that little Schröckie provided. An improvised chip in the 70th minute from the right was parried away by Faqiryar and only half-cleared by a defender. The ball fell invitingly to Sato, whose drive from 30 yards was heading for the upper corner until pushed away. In added time just moments after Fakhrudin’s header, even Martin Steuble joined shooting practice with a thunderous left-footed drive that had Faqiryar at full stretch once again. 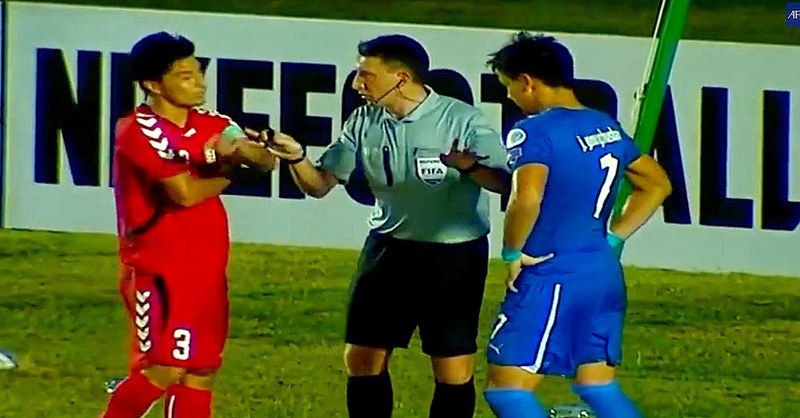 Despite firing blanks against Afghanistan, the Philippines ought to look at the goalless stalemate as a point earned rather than two points dropped. It is always better to grow into a tournament instead of begin one with big guns firing but then lose steam later on. Possession was frequently squandered in the attacking half of the field earlier in the match, but passing became more cohesive and incisive in the final half hour. As we all saw in the friendly international against Azerbaijan, the current set of players in the squad can correct their collective weaknesses within the course of the same match. This trait augurs well for the rest of the tournament. We are all assured that the team will get stronger with each match and hopefully peak if and when it can get to the finals. Apart from the inability to score, of some concern to team management will be a bit of fragility in defending set pieces as well as some vulnerability to over the top balls. That said, Phil Younghusband and Robert Gier, the two players we normally see poaching goals and organising the backline were both suspended. Acknowledgment: Top photo captured from match video on the AFC Channel on YouTube.